"Maurice E. Müller turned the world of surgery upside down"
On March 28, 2018 Maurice E. Müller would have become 100 years old. At the memorial event of the University of Bern and the Insel Gruppe AG, those present looked back upon the extensive life’s work of this great visionary, pioneer of orthopaedic surgery, and conjurer. "The aim of Maurice E. Müller was to ameliorate the suffering of his patients", said Christian Leumann, Rector of the University of Bern, in his welcoming address in front of more than 100 guests in the surgery lecture hall at the Bern University Hospital. 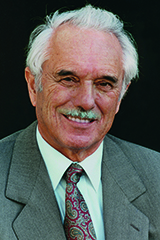 For more than 40 years, Maurice E. Müller achieved milestones in accident surgery and revolutionised surgery upon the locomotor system. This was at a time during which broken bones still represented a great medical challenge. "In 1945 the Swiss public sector health insurer Suva paid permanent pensions for fractures of the femur in 70% of cases. Maurice E. Müller realised that there must be better solutions", said Christian Leumann. "He had the right instincts"
In the lecture of Professor Klaus-Arno Siebenrock, Director of the Department of Orthopaedic Surgery at the University Hospital, the audience learnt that Maurice E. Müller contributed to the development of genuinely better solutions. "In the 40s, fractures and joint diseases were conservatively treated, with casts or splints." He said that Maurice E. Müller had then learnt of the first bone fixations and wanted to see how they worked. "He had the right instincts", observed Siebenrock. Müller devised an external fixator, with which screws are driven into the bone from outside the body, to force the bone to heal. "With this revolutionary idea of osteosynthesis, he turned the world of surgery upside down. And despite many critics and sceptics, he was not deterred." Klaus-Arno Siebenrock told many fascinating anecdotes from Maurice E. Müller’s career. For Müller, he said, it was clear that patients should be moving about again as soon as possible after bone fragments had been operatively joined together. "Life is motion and motion is life", was his credo. These also applied to the people with one of the many hip prostheses that Müller developed. His expertise in this field even brought him an audience with the Pope, who had a poorly functioning hip prosthesis and asked Müller for his assessment. Klaus-Arno Siebenrock explained: "People say that Müller gave the Pope a good telling-off and advised him to exercise more. I believe the Pope just nodded." In a second talk, Jean-Pierre Jeannet, Professor Emeritus for Global Strategy and Marketing at the International Institute for Management Development (IMD) in Lausanne and the Babson College in Massachusetts, spoke about Maurice E. Müller as an entrepreneur. He devoted a large part of this to the AO Foundation, the working group for osteosynthesis, which Müller founded in 1958 together with colleagues. "Maurice E. Müller was not only a business entrepreneur, but also a social entrepreneur. The AO Foundation was founded as a non-profit organisation with the single purpose of improving operations, for the benefit of patients." The pioneering work of the AO in the development of instruments and techniques is still recognised and disseminated throughout the world. Jean-Pierre Jeannet did not know Maurice E. Müller personally; he is currently writing a book about the AO Foundation. Between 1998 and 2005 Müller donated a large part of his fortune to the Zentrum Paul Klee in Bern. The change from entrepreneur to patron did not change his attitude at all, said Jeannet: "He was just as involved in his philanthropic enterprises as he had been with the AO." The Maurice E. Müller Foundation not only supported the Zentrum Paul Klee, but also biomedical and orthopaedic research, training and evaluation, with around 250 million francs. At the University of Bern, the Institute for Evaluative Research in Orthopaedic Surgery and the Institute for Surgical Technology and Biomechanics were founded with funds from this foundation. Another one of Maurice E. Müller’s gifts, which was mentioned by several speakers in the course of the evening, was magic. Müller’s precision was said to have also come in useful here, as Jean-Pierre Jeannet explained: "Thanks to his powers of observation and dexterity he mastered card tricks very quickly. He didn’t just take a look, he also saw." The memorial event was then dedicated to the pioneering spirit of Maurice E. Müller. Four young researchers presented their dissertation projects, showing that Müller’s flair for innovation is continued in Bern today. At the end of the event, Rector Christian Leumann and Uwe E. Jocham, President of the Board of Directors and General Manager of the Insel Gruppe AG, uncovered a bust of Maurice E. Müller and ceremonially renamed the surgical lecture hall 2 the "Auditorium Maurice E. Müller". Christian Leumann and Uwe E. Jocham together uncovered the new sign in the "Auditorium Maurice E. Müller". Maurice E. Müller became world-famous for his pioneering work in the field of orthopaedic surgery. For more than 40 years he achieved milestones in traumatology and revolutionised surgery upon the locomotor apparatus – including with the development of the total hip prosthesis. Maurice E. Müller was not only a brilliant surgeon, but also a visionary and a generous patron. Thanks to him, Bern became a globally recognised centre of orthopaedic surgery. Maurice E. Müller was born on March 28, 1918 in Biel and grew up there. On May 10, 2009 he died at the age of 91. Ivo Schmucki works as an editor in Corporate Communication at the University of Bern.